Type in your ZIP code or city name. Type in your zip code or "city, state" combination in the Location field above, then click Calculate Heat Index. To Subscribe to heat index alerts, you must have an OSAA website account. Only logged in users can subscribe to receive OSAA Heat Index Alerts. Generally, synthetic turf fields are 35° to 55°F hotter than natural grass. Consider the hotter temperatures on artificial surfaces. Schools shall monitor the heat index for their geographic area prior to practices. Outlined below are the steps that each member school shall take in order to implement this policy. NOTE: This policy applies to all OSAA sanctioned sports and activities in all seasons. Indoor activities where air conditioning is available are not bound by this policy. Subscribe: Athletic Directors and Coaches shall subscribe to receive OSAA Heat Index Notifications at www.osaa.org/heat-index. An OSAA Heat Index Notification is generated for areas where the forecasted high temperature and relative humidity indicate a forecasted heat index that may require practice modifications. Only those areas that have a forecasted heat index of 95°F or higher receive alerts. Notifications are sent daily via e-mail and/or SMS to subscribers. Designate: Schools shall designate someone who will take the necessary steps to determine and record the heat index for your geographic area within one hour of the start of each team's practice. This is only necessary on days when the school receives an OSAA Heat Index Notification. Depending on practice schedules, it is possible that the designated person will have to record the Heat Index multiple times on the same day. Calculate: Within one hour of each team's practice on days when the school's subscribers receive an OSAA Heat Index Notification, the designated person shall utilize the OSAA Heat Index Calculator to determine the actual heat index. Record: If the actual heat index is 95°F or higher, the designated person shall record it using the OSAA Heat Index Record or by printing out a copy to be kept at the school for inspection at the request of the OSAA. A separate record shall be kept for each fall sport at each level. Practice modification, as necessary, shall also be recorded. If the actual heat index is less than 95°F, no action is needed. OSAA Recommendation: Stop all outside activity in practice and/or play, and stop all inside activity if air conditioning is unavailable. OSAA Recommendation: Postpone practice to later in the day. Maximum of 5 hours of practice per day. Practice length a maximum of 3 hours. Mandatory 3 hour recovery period between practices. Alter uniform by removing items if possible - allow for changes to dry t-shirts and shorts. Contact sports and activities with additional equipment - helmets and other possible equipment removed if not involved in contact or necessary for safety. Reduce time of planned outside activity as well as indoor activity if air conditioning is unavailable. Provide ample amounts of water. Water shall always be available and athletes should be able to take in as much water as they desire. Watch/monitor athletes for necessary action. OSAA Recommendation: Consider postponing practice to later in the day. Water should always be available and athletes should be able to take in as much water as they desire. Schools and students are required to adhere to the following practice model. All practices shall allow for water breaks and general acclimatization to hot and/or humid weather. Ample amounts of water should always be available and a student's access to water should not be restricted. In addition, all practices shall follow the fundamentals set forth in the NFHS's Heat Acclimatization and Heat Illness Prevention Position Statement. While the risk of heat illness is greatly dependent upon weather conditions, the fundamentals in the NFHS’s Heat Acclimatization and Heat Illness Prevention Position Statement promote safety and minimize injury risk in any setting. Teams shall have two weeks of practice prior to playing in a jamboree and three weeks of practice prior to playing in an interscholastic contest. Students may participate in multiple practice sessions per day, but not on consecutive days. Single Practice Session. No single practice session shall be longer than three hours, including warm-up and cool down. On days with a single practice session, students are limited to a maximum of one hour of weight training either before or after practice but not both. At the beginning of football practice each year, every student shall be required to have two days of helmet only practices. During this period, the only optional pieces of protective equipment that may be worn by individuals are shoes and helmets. No other pads (e.g. shoulder, knee, thigh, hip, and rib) are to be worn. During helmet only practice, no full contact drills or any other activity may occur which would result in a player completing a tackle, or being blocked or tackled to the ground. This policy does not preclude light contact with blocking sleds and tackling dummies. However, it is strongly recommended that any such contact be carefully controlled. The second practice session of the first two multiple practice days shall be a teaching session only. Conditioning drills (gassers, timed runs or sprints) shall not be conducted. Following two days of helmet only practices, students may wear helmets and shoulder pads on Day 3. On this day, the only optional pieces of protective equipment that may be worn by individuals are shoes, shoulder pads and helmets. No other pads (e.g. knee, thigh, hip, and rib) are to be worn. During helmet/shoulder pad practice, no full contact drills or any other activity may occur which would result in a player completing a tackle, or being blocked or tackled to the ground. This policy does not preclude light contact with blocking sleds and tackling dummies. However, it is strongly recommended that any such contact be carefully controlled. Following two days of helmet only and one day of helmet/shoulder pad practices, a student may participate in a contact practice. During a contact practice the remainder of the football gear as described in the NFHS Football Rule Book may be worn and activity is not restricted with regard to contact. A school shall not permit an individual to participate in a contact practice unless that individual has had at least two days of helmet only and one day of helmet/shoulder pad practice. Contact with another person on the fourth and fifth days should be controlled. Thud - Drill is run at assigned speed through the moment of contact; no predetermined "winner." Contact remains above the waist, players stay on their feet and a quick whistle ends the drill. This applies to simulations and drills involving any number of players. Live Action - Drill is run in game-like conditions and is the only time that players are taken to the ground. This applies to simulations and drills involving any number of players. A student may practice for no more than six consecutive days without a rest day. A rest day must be complete rest - no organized team activity is allowed. A student shall become eligible to participate in a jamboree or interscholastic contest after completing a minimum of nine days of actual on-field practice. All practices shall allow for water breaks and general acclimatization to hot and/or humid weather. Ample amounts of water should always be available and a student's access to water should not be restricted. In addition, all practices shall follow the fundamentals set forth in the NFHS’s Heat Acclimatization and Heat Illness Prevention Position Statement. While the risk of heat illness is greatly dependent upon weather conditions, the fundamentals in the NFHS’s Heat Acclimatization and Heat Illness Prevention Position Statement promote safety and minimize injury risk in any setting. Multiple Practice Sessions. On days with multiple practice sessions, students shall not engage in more than five hours of total practice, including warm-up and cool down. No single practice session shall be longer than three hours, including warm-up and cool down. There must be at least three hours of recovery time between the end of one practice session and the beginning of the next practice session on a day with multiple practice sessions. During this recovery time, students may not engage in other physical activities (e.g. weight training, etc.). Q: Can the one hour weight training session allowed on single practice days be conducted both prior to practice and after practice if players only participate in one of the weight training sessions? A: Yes, multiple one hour weight training sessions may be held but individual players are limited to participation in a single session. Q. Is the one hour weight training session allowed on single practice days required to be "immediately" prior to and after the practice? A. No, the training session does not have to immediately precede or follow the scheduled practice. Q. Is the one hour weight training session allowed on single practice days also allowed on multiple practice days? A. No, weight training conducted on multiple practice days counts toward the daily five hour practice limit. Q. On single practice days may coaches conduct classroom training sessions that would involve no physical activity? A. Yes, classroom instruction that requires no physical activity is allowed and does not count towards the daily five hour practice limit. Q. Is classroom instruction with no physical activity allowed during the required three hour recovery period between multiple practices? A. Yes, classroom instruction that requires no physical activity is allowed during the recovery period. Q. A team plans to conduct multiple practices on a single day but wants to reduce the length of each practice to 90 minutes. Can the team reduce the required recovery time of three hours between practice sessions because they have used less than the maximum practice time allowed? A. No, the three hour recovery period between practices is required regardless of practice length. Q. Are multiple practices on a single day required for all Fall teams? A. No, teams are not required to have multiple practices on a single day. If multiple practices are conducted, the second practice of the first two multiple practices days is a teaching session only. Q. What is the definition of a "teaching session"? A. Teaching sessions do not involve any form of conditioning but may include sport-specific drills. In Football, light contact with bags is allowed but full contact situations are prohibited. Q. How do you calculate practice time for multiple sport athletes participating in more than one Fall sport? A. Practice hours are cumulative. On a single practice day, the three hour practice limit may be split between the two sports but the total practice time, including any breaks, must fit within the three hour limit. On a multiple practice day, the daily five hour practice limit may be split between the two sports but all required recovery periods must be implemented. Any participation for a fraction of a half hour counts as a half hour towards the daily practice limit. Q. If Fall multiple sport athletes practice one hour with the Football team and two hours with the Soccer team are they required to have a recovery period between the two practices? A. No, this is considered to be one three-hour practice and no recovery period is required. If the combined practice time, including any breaks, exceeds three hours then a three-hour recovery is required. Q. If a team practices for 1 hour 15 minutes, takes a 30 min break, and resumes for 1 hour and 15 minutes, does this constitute a multiple practice day or one three-hour practice? A. This would constitute one three-hour practice. Teams are allowed to have periodic breaks but may not exceed the maximum practice time of three hours, including all breaks within the schedule. Where Does the OSAA Get the Heat Index Calculation? A heat index is an index that combines air temperature and relative humidity in an attempt to determine the human-perceived equivalent temperature; "how hot it feels." The result is also known as the "felt air temperature" or "apparent temperature." For example, when the temperature is 90°F with very high humidity, the heat index can be about 106°F. The human body normally cools itself by perspiration, or sweating. 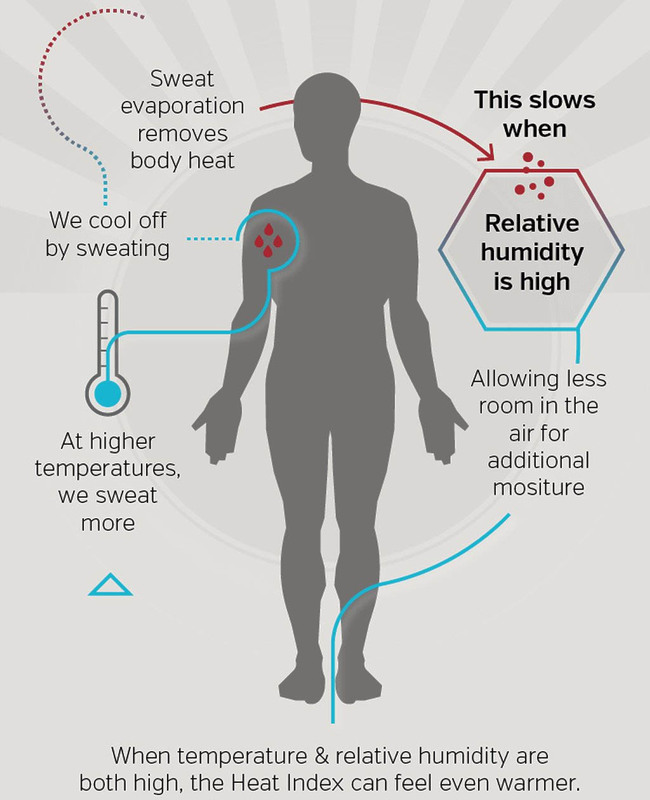 Heat is removed from the body by evaporation of that sweat. However, relative humidity reduces the evaporation rate because the higher vapor content of the surrounding air does not allow the maximum amount of evaporation from the body to occur. Looking at the table, it is important to note that any temperature above 86°F will "feel" at least 86°F. Virtually every heat index will be at least the current temperature, if not hotter. The OSAA website uses a custom script to calculate a given heat index and forecasted heat index for a given location (i.e. city name or ZIP code). This is accomplished via a weather API service through AccuWeather. This resource allows us to plug in a specific location and get back a data packet with pertinent information to determine a heat index. Specifically, we extract the returned current temperature, relative humidity, and forecasted high temperature. Our custom calculator then takes those variables to get a current heat index and a forcasted "high heat index". The calculator will then show OSAA recommendations in accordance with the OSAA practice model. Two variables, temperature (T) and relative humidity (R), are necessary to calculate a heat index. Given a current temperature and a relative humidity, a heat index can be calculated easily using the following polynomial equation. The formula approximates the heat index in degrees Fahrenheit and conforms to the NOAA National Weather Service’s Heat Index Lookup Table. Why Do Other Websites Have Different Numbers? There are other website services out there that can report a heat index. Those sites (like NOAA’s heat index maps) provide a heat index forecast for a broad area and are updated less frequently that the weather service OSAA implements. Most weather providers rely on National Weather Service (NWS) observation stations that are primarily located at airports and military bases. Each state only has a handful of these stations. The entire state of New York has less than fifty such sites, for example. Their reports are only accurate and relevant in the immediate vicinity of the observation station and generally updated only once every hour. The AccuWeather API service generates forecasts with Superior Accuracy™ harnessing the expert skills of the world's leading meteorologists in tandem with the most robust database of forecast models, most advanced global forecast engine, proprietary patents, and comprehensive validation results pinpointed for every location on Earth. This allows the OSAA Heat Index Calculator to use data for geographically specific results and up-to-date information. By OSAA policy, schools are required to check their practice location's heat index through the OSAA Heat Index Calculator, no other site. The heat index is categorized and suggested practice modifications are provided. This helps us ensure consistency and lends an easier approach for school administrators and coaches.